With their fanciful costumes and comedic personas, clowns seem like the epitome of joy. But these figures of fun also provoke a horrified response and have even inspired their own phobia. Although it’s not officially recognized in the American Psychiatric Association’s DSM-5 categorization of disorders, coulrophobia, the fear of clowns, is one of the most commonly known phobias in the public perception. It’s easy to see why clowns are sometimes viewed as icons of fear. Permanent, frozen smiles and uncanny, mask-like makeup inspire nightmarish visions. Popular culture helped catapult the clown to a titan of terror. 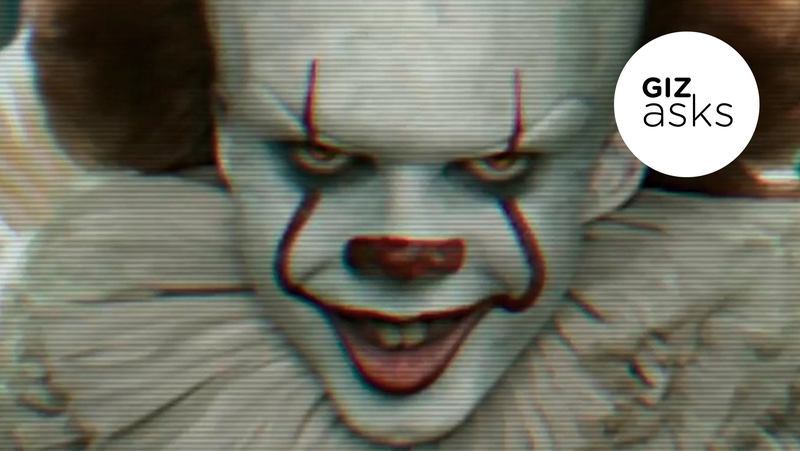 Stephen King’s 1986 book It, and the movie remake opening September 8th, follows seven childhood friends as they are terrorized by the evil clown Pennywise who preys on their deepest fears and insecurities. The evil clown had already leaped from the pages of fiction into reality in the late 1970s when real-life serial killer John Wayne Gacy was dubbed “Killer Clown” after it was discovered he dressed as “Pogo” performing at fundraisers and children’s birthday parties. In 2016, an evil clown craze seemed to spread across the world with reports of menacing clown sightings. So what does it mean when an actor takes on the role of an evil clown in cinema, where the wicked clown persona is more popular than ever? This week on Giz Asks, we talked to several experts—including psychologists knowledgeable about performance and several actors who played killer clowns—what it means to transform into an audience’s worst, red-nosed nightmare. What is the hardest part about portraying a troubled clown? Putting him away at the end of the day. I know that sounds a little weird. I work organically. Within each and every person is every personality type. There’s a Captain Spaulding in you. What I had to do was go in and find that Captain Spaulding in me, and bring him out. I got to put him away at the end of the day or else bad things can happen. That was the hardest work in creating the character—finding that place in me that could go there. I don’t know that there was very much preparation. I had to find the thing inside me that would make me retaliate, hurt people, be a sociopath. I used that to dig around and find him. Even the biggest pacifist, if you will, could find a reason to pick up a gun and kill somebody. There is some action that would have to take place to make them do that, even though they might be the most peaceful people in the world, there’s always something that will trigger this kind of behavior. So, that’s what I had to do. How do you feel the role affected your overall state of mind or mental health? I was ok. I didn’t do anything sociopathic. We were all there together all the time, so we were all decompressing after the film [House of 1000 Corpses] wrapped. It was a lot of fun. We had a chance to do all kinds of crazy things without really hurting anybody. Yes, in a way. You get a chance to release that craziness—and now you’re in control of it, and it’s not in control of you. I wanted to say that from my experience as a hypnotherapist, I’ve been able to explain to people why there is a clown phobia. Mom and dad think it’s going to be a great thing to take little Billy to the circus, when he’s under eight years old or so. They do, and he’s having a great time—until somebody shows up, and it’s a clown. They’re weird-looking, they don’t look like mom and dad, aunt Mary, or anybody. They don’t talk. That’s weird. They’ve got the crazy clothes on, and that’s a little off-putting. And in their act, somebody gets hurt, whether it’s water in the face, they slip on a banana peel, or whatever. And that’s scary to a little kid. Then they go into their primal consciousness, which is where their fight/flight mechanism is, and they run. As an adult, every time they see a clown, the run mechanism kicks in. Those earlier recordings of your subconscious mind stay there until you work through them in therapy and so forth. Do you appreciate horror movies? I like good horror. Slasher films showing a lot of blood for blood’s sake is kind of stupid. But I did a film I was very proud of called Spider Baby. That was Lon Chaney Jr.’s last starring role. That was really kind of special, and it was probably the first horror film that was done without one drop of blood. It was creepy. You never really knew what was gonna happen. It was always on the edge of something terrible about to take place. That’s, I think, good horror writing. Do you think that people who appreciate horror and dark movies are more adaptable to things in life, because they’re not afraid to face the dark side and tap into that sometimes? They don’t have a problem with it, because real horror fans are the kids that were different. Basically, the outcasts. We just think a little differently. I appreciate that. In fact, people who like horror are the ones who, when they were in school, had a rougher time or whatever. There are no better fans in any other genre than horror film fans. They are absolutely amazing and dedicated to what you’re doing. Answering this question depends on a number of factors. A) Actor training and technique: Some drama schools advocate training methods and techniques where actors are encouraged to identify with and become the character. The depth with which the actor does these things will likely impact on whether the actor is affected psychologically by playing the role. When Heath Ledger played The Dark Knight, reports claimed that he was consumed by the character. Over identification with roles could potentially lead to mental health problems. Roles that are emotionally demanding can impact on the actor and their relationships. For example, Angelina Jolie reportedly discussed the difficulties filming By The Sea which potentially affected her marriage. B) Deroling: Deroling is not actively taught in drama schools but is a significant part of training for dramatherapists. The idea being that certain techniques help the actor (or client/patient) to identify the differences between themselves and their characters/roles and hence help separate the actor from the person they are playing. The more the actor takes his work home, the more likely they are to be affected by it. Similarly the extent to which the actor has outside interests which allow them to relax and be themselves will likely help to restore psychological flexibility and well-being. C) Background of the actor: Does the actor have a history of mental health problems or low mood? The stress-vulnerability model might suggest that actors that don’t have suitable coping strategies or have stressful life events that coincide with playing this type of role may be more affected psychologically. If the actor had negative experiences with clowns when they were younger, playing a role of this type could bring up difficult feelings and experiences, making deroling more important. D) Perceptions: How readily do the other actors become affected by the clown when the actor is in role. Once the film is released how do others respond? For example, when Rebecca de Mornay starred in The Hand that Rocks the Cradle, public perception of her as a person changed. People believed she was the character and both avoided her and attempted to keep children away from her. How the actor perceives the character is also significant. Does the actor feel that playing an evil character somehow make them the same psychologically? E) Catharsis: Playing this role could be helpful psychologically. Some actors speak about how playing certain roles allows them to express unwanted emotions or feelings (such as anger or evil thoughts), but they can do so in a safe and distances way i.e. through the character. So rather than being damaging, playing a role of this kind, if managed appropriately by the actor, could be fun and helpful emotionally. Carl Jung considered the shadow sides of the personality to be the seat of creativity, and finding ways to express dark or primitive impulses in a socially acceptable way, such as pretending to be an evil clown character in a movie, allows the actor to sublimate any of his own shadow impulses. Actors are working with imaginary circumstances and fake blood. It is not psychologically damaging to portray such characters, and in fact, there may be important psychological benefits to playing out these scenarios in art, rather than in life. I am Harrod Blank, and I played a lot of the “Slim” scenes and many of the larger Killer Klowns as I am 6'4" tall. The ironic thing was that I showed up at the audition with my car Oh My God!, which was kind of a clowny art car. I’ve always been an obnoxious and loud type person—my totem animal is the rooster—but evil was not something I ever was or wanted to be. When I was 6 my parents split up, and my mother’s new boyfriend was a professional clown—Skippy The Clown. They moved to a commune in the Santa Cruz mountains. So perhaps I learned some tricks from him? When I was reunited with [directors] the Chiodo brothers 25 years after the film came out at horror conventions to sign autographs, I was amazed at the serious fear that some had about clowns. Some people would not talk to me or get very close—and I wasn’t even dressed like a clown. The one clown that I did come to know and filmed for my first film Wild Wheels was beaten as a child. All he wanted to do was make children happy, so he covered his car with toys. He was famous in Austin and called Darrell The Clown. That sort of made me wonder if other clowns became clowns out of sadness. But then there is Charlie Chaplin, who was a genius at making fun and making people laugh. I am more in favor of that type of clown. I think what is interesting about clowns is that behind a mask no one knows who you really are, so evil can more easily hide. This is why I think the concept of Killer Klowns was so brilliant. And to answer your one question, I don’t feel that playing an evil clown is harmful to your mental health. On the contrary, I think playing an evil clown is a form of play and play is healthy for the soul. I actually had a blast working on that film, which I felt was very creative and positive. Drinking the blood out of the cocoon was the only moment I thought was a bit far fetched, but that is precisely what made it great in the end. I think the Chiodo brothers are amazing and should be given everything that they need to do a sequel, most importantly the intellectual property that they came up with in the first place. Professor, Department of Kinesiology, California State University, Northridge, Clinical Psychologist, wrote study about the psychological vulnerability in actors. Our research does not investigate this question. We do know that performers tend to have a higher distribution of unresolved past trauma and loss, but we do not know how that affects them when they are actually performing. Our data suggests that despite past childhood adversity and trauma, performing artists value creative experiences and are able to achieve optimal flow experiences. Several people on our team were terrified of clowns, and working with our demonic clown character really took a toll on them after a few days. The rest of us also started to get exhausted with the way scary clowns were dominating our lives. Making a clown movie definitely takes something out of you that making other kinds of monster movies doesn’t. To answer your question, it depends on several different factors. Given where we are in psychology, as a result of even more decades of research, “it depends” is (or at least should be) used more frequently than otherwise. I say depends in this case because from a practical standpoint the factors to consider include the following — 1) the level of this performance, i.e. Broadway 2) the amount of time spent in rehearsal 2) what else is going on in the person’s life 3) what being “evil” would look like, i.e. the degree to which that person inflicts physical or emotional pain 4) what the person is doing after the production is over and 5) the person’s motivations/intentions for taking on that role both conscious and unconscious. These would be some of the primary practical considerations when answering your question. I would want to know the “potency” of the role and the quality of the person’s life including their health and well-being. The potency is crucial to know because from a psychological perspective that contributes, as you know, to the level of internalization or embodiment of that character. If the “dose” is quite potent, which is common at higher levels in theatre, dance and music (boarding on having to be quite compulsive, obsessive and perfectionistic, boarding on or full-blown workaholism), and the person is just in a bad space in life, the result could be harmful. I see this in high-level performers in all areas of life when they are not taking on the role of an evil clown. Between the person’s standards/expectation and the interaction with the culture (in sport, music, business, etc. — there is a culture with insane values and beliefs) can be lethal in some cases. As we see high rates of substance abuse, depression, and suicide in certain professions. So it would be crucial that the person in that role has what we call “protective factors” in place, i.e. good support system, feeling loved and safe in the world, good dietary habits & sleep hygiene, and perhaps some degree of spirituality so this role as an evil clown does not own them and define them, which I see all the time in different arenas. Then on a deeper, more psychological level, it depends on the person’s personality and how integrated they are versus fragmented. Someone who is fragmented has poor “ego strength” which leads to difficultly with boundaries, both internal and with other people. They are more likely to lose themselves in any particular role and have difficulty separating the clown from who they are. People who tend to be higher on scales that measure suggestibility and absorption (two factors correlated with hypnotizability) can be more at risk for adverse effects from playing this role. Especially if it is a highly potent dose, it is like a form of hypnosis for that person. Now this can be highly beneficial in some situations, but again, it depends on all these factors. And another psychological variable would be how “ego syntonic or dystonic” the role might be. This isn’t exactly the correct usage of these words, but I use it to make the point. In simpler terms, how consistent is this role of the evil clown with how the person sees him/herself (self-image/concept)? We all have an “evil side” (aka dark side, shadow, disowned parts, repressed parts of ourselves, internalized negative introjects, etc. in psychology). Depending on these psychodynamics of the actor/actress, this role could ignite regression, destabilization and/or disassociation. And if so, will ultimately play out both intrapsychically and interpersonally. Thus, given some of these considerations, a person playing this role would benefit from being in psychotherapy to not only promote stabilization/health, but that role providing the opportunity for tremendous personal growth. I loved this question as it has far reaching implications for life as we know it. As I made reference to - people over identifying with what they do (the role they play, following the “script” written for them by parents, coaches, teachers, religion, spirituality, society, etc.) versus who they are as a human being, and the negative impact “playing an evil clown” can have. I am seeing this with not only adults, but kids more and more. When we in psychology address the concept of “harmful effects” whether it be a result of drugs/alcohol, cell phones, exercise, yoga, being a professional musician, etc. we think about the impact on a continuum. Similarly to how we think of the “potency” that I addressed, i.e. how much alcohol/drug and what type, how much cell phone usage, how long being in an abusive relationship, etc. Specific to your question, the harmful effects can be viewed on the following continuum. On one end a ONE (minimal impact — the actor/actress might experience some restlessness, discomfort, a dream or two about being the evil clown, but it quickly goes away once the production is over), to a TEN (the actor/actress experiences change in mood, increased anxiety, severe insomnia, intrusive thoughts, using drugs/alcohol to cope, wanting to avoid going to rehearsal, experiencing somatic symptoms during rehearsal, having nightmares) - that if I were to generalize, would involve murder, physical/emotional violence, annihilation, terror, among other features that symbolically could represent what we call a self state (healthy, positive, prosocial side) at war with the other self state (shadow, dark side, disowned parts, repressed parts that are characterized by anger, rage, hostility that has been unexpressed and playing this role triggers those feelings that are “ego dystonic” and a threat to his/her self (persona) - one side would be “killing off” the other - and this could lead to decompensation, regression, destabilization, etc.